Barn find 1970 ATC US90. Worth Restoring? 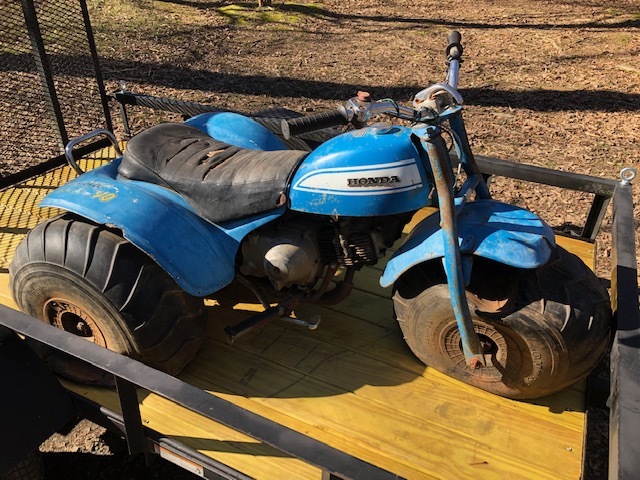 Thread: Barn find 1970 ATC US90. Worth Restoring? As I usually spend the afternoon searching local craigslist and facebook ads, I ran across a 1970 US90 about and 1.5 hrs from me for what seemed like a fair deal. I have never seen another US90 locally much less a blue 1970 year model, so I was on the hook. It looks complete and original and the engine turns over with compression from the pull starter and oil is full. Tank is clean and looks like it's not rusted out. Tires are completely rotten, so there's the big kicker. I'm sure I can get it running and cleaned up a lot, but the problem will be finding replacement tires if I want to keep it original. I don't usually pay over a couple hundred bucks for a barn find ATC unless it's something special, but I went into this one blind and coughed up $500...the next day I start to feel a bit of buyer's remorse... How'd I do? 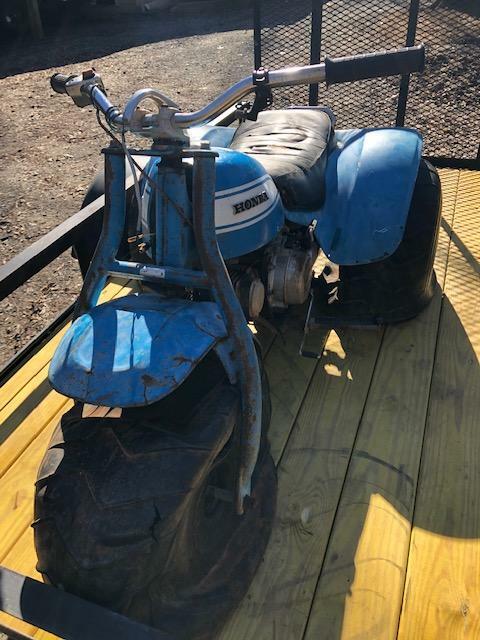 Man, wish you was around when I was trying to sell my 1976 ATC90 for $500, it just needed the inside of the gas tank fixed up and it was a nice OEM rider with the seat seams starting to come apart (not ripped that I can remember). I ended up parting out the machine and got quite a bit more than I was asking and I still have some parts left (I just wanted what I had into it back). Anyway, I had a 1970 US90 as well, but it wasn't even half the machine, same color though. The front forks/fender sold really fast. I don't think I kept any of the tires, they were all pretty bad anyway (dry rotted). Depending how far you want to restore it, I suspect it could be worth it, but I'm not sure what a nice US90 goes for, never seen one locally except the trashed parts machine I bought. It seems mostly complete, I think just a set of tires and fix/replace the front fender and repaint things and it will look pretty nice. Seat is probably a little too far gone, but I'm no expert on them it looks orig though. If you need any parts, let me know and I can check if I have it, not a whole lot left, but I know I have some engine parts, the ATC90 rear fender/seat (no clue if the seat would be the same or not), and some misc smaller parts in boxes. Anyway, good luck on the project, should be a fun one. Oh now that I think of it, I think I have a photo of the US90, and probably a pic of the ATC90 buried in my shed before it got parted out lol. I also threw in a pic of the front tire that came on an ATC110 with the same bolt pattern as the US90. Don't know much about the source of the rim or anything, but could be an option if you're not going with OEM correct parts. I think I might have that tire around yet in a shed. Hell yes fix it! Keep them alive!!!!! Tires will be your biggest expense. Honestly if you are going to ride it vs letting it set there and look at it I would put regular tires and wheels on it. If you are going to let it set you can probably find a descent set that doesnt hold air for a few hundred bucks. Keep an eye on ebay. This one is right down the road from me in my home town. I have my eye on it. When it come available I'm on it! Worth restoring? If you aren't gonna restore it then what are you gonna do with it? I don't restore machines, I buy them to ride them. Everyone has their own thing though. I guess I'd be part of the crowd making their parts more rare. I think it has potential but it's going to run into some cash for sure. The price you paid is exactly that...........it's the price you were willing to pay at that time. Don't fret about it, it's done move forward. 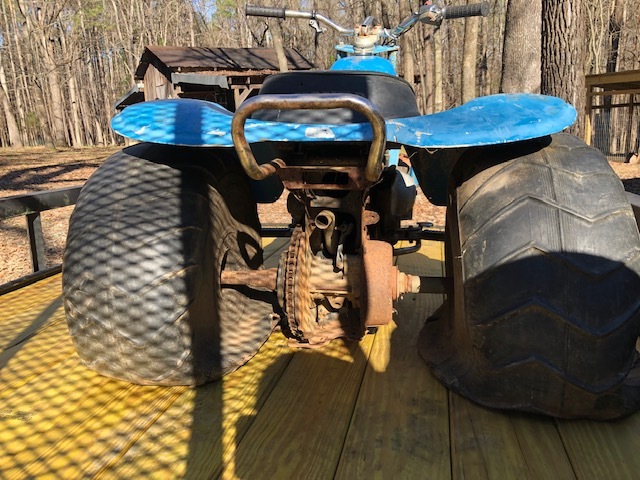 Does it have the tire pump on the side of the frame, that alone is worth a couple of hundy? Does it have the tool kit located in a pocket at the front of the seat above the fibreglass? I'd put some newer style rims and tires on it and ride until you gather everything up to refurbish the old girl. I honestly think you did really well the bike is complete and mostly all there. replace the tires with normal ones get the engine running and most importantly wash the thing. I think for at least awhile I would just run It as is with new tires and rims cause the bike really looks to be in good shape, especially for its age. It's probably worth mentoning I wasn't bashing the OP's buying decision, I have no clue what a US90 is worth. Around my area the ATC90's value around $300-800 in rid-able shape or near rid-able shape when I was trying to sell my 76 one, this was probably close to 5 years ago too, I'm sure prices have gone up since then. Anyway, I'm on board with the common theme, fix it into a rider, if you want to make it prettier after that, then dump the money into till it's as nice as you want it. 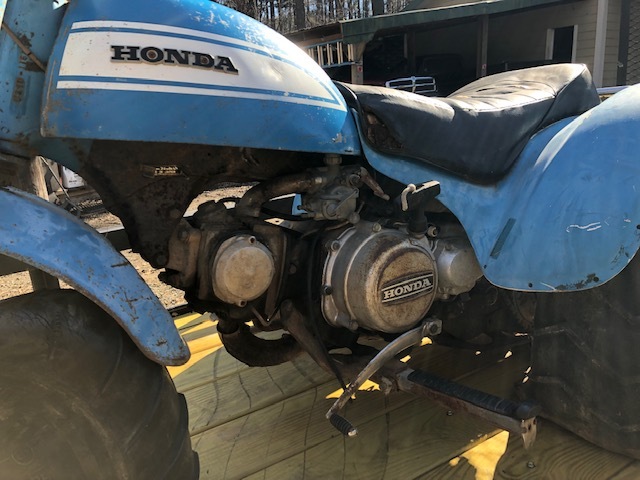 First step is to make sure what you have doesn't need a ton of parts and such just to get going (doubt that's an issue though), and of course get the engine running and such. I'm subbed for the build progress on this, hopefully things go smoothly for you. If the tire price is above and beyond what you're willing to contribute, just list it for 600$ and accept a decent offer. These are tough buys here. All of the folks on FB have unfortunately drove the prices of these things up. Just because it's a (rare) color dosent always make them valuable. We've worked on plenty of these generally we like to buy at a lower price point but we are into most for the flip. If this was ours and we wanted to keep it we would clean and patch the tank if needed and leave all of the patina and paint on the tank, fenders and forks. Get it running well and ride it. Down the road sell it for what ya have into it.